Patients who choose Dr. Sean Freeman at The Center for Facial Plastic and Laser Surgery are choosing a double board certified facial plastic surgeon who has specialized in lasers and facial cosmetic surgery since 1988. He offers laser skin care treatments at his Charlotte, NC practice that can accomplish a variety of goals such as reducing wrinkles, minimizing skin discoloration, removing tattoos, and treating vascular lesions. To learn more about laser aesthetic services, you can request your consultation online to receive $25 off your consultation fee or call Dr. Freeman’s office at (704) 543-1110. There are several different methods that accomplish non-ablative skin rejuvenation for fine lines and wrinkles. Dr. Freeman has extensive experience with laser procedures and feels that the Smoothbeam® laser from Candela® offers the best result, especially for fine lines and wrinkles around the eyes and mouth. Dr. Freeman is the first cosmetic laser surgeon in the Charlotte area to offer this technology. The term “non-ablative” refers to procedures that rejuvenate the deeper part of the skin (known as the dermis) without injuring the upper part of the skin (known as the epidermis). Non-ablative skin rejuvenation procedures offer patients improvement in fine lines and wrinkles without the downtime associated with laserbrasion or surgery. The treatments usually require only a topical anesthetic and are quite comfortable. 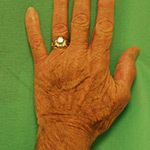 They are performed every 4 to 6 weeks and leave the skin slightly red for less than 30 minutes in the average patient. Most patients have between 4 to 7 treatments with improvement occurring gradually over time. In addition to helping fine lines, wrinkles, and acne the SmoothBeam laser is one of the few that can flatten sebaceous gland hyperplasia. This hard to treat condition runs in families and typically starts in the 3rd to 4th decade. 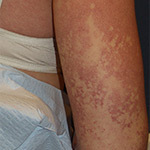 It presents with raised flesh colored lesions that are difficult to hide. They are usually found on the forehead and cheek area. Several treatments with the SmoothBeam in usually very effective in erasing these lesions. 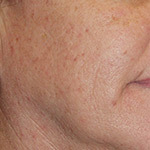 Laser skin rejuvenation is a new technique that involves using a laser to target small abnormally dilated blood vessels, as well as brown discolored areas of the skin. These small, dilated blood vessels and brown spots are typically seen in patients over age 30 who have had excessive exposure to the sun over the years. This laser technique can vastly improve the visible effects of past overexposure to the sun. Laser skin rejuvenation can be safely performed on any area of the body that has suffered from sun damage, including the hands, face and chest. Dr. Freeman will consider skin color, thickness and texture, and your age to determine whether or not you are a good candidate for laser skin rejuvenation. If he determines that it would be an appropriate procedure for you, you can rest assured that there is little risk associated with the treatment. Dr. Freeman’s patients throughout the Southeast and in North Carolina are highly satisfied with their skin rejuvenation treatments and report uniformly impressive results. Some exciting aspects of this technique are that it can be completed without a local injection and leaves the skin looking red and irritated for only about 3 to 5 days. A series of treatments is recommended with most patients opting for 2 to 3 treatments.These treatments are carried out every 4 to 6 weeks and can be done over your lunch hour. Laser skin rejuvenation is not a replacement for laser resurfacing in that it will minimally reduce wrinkling.For further wrinkle treatment, some people may want to consider BOTOX® Cosmetic. A tattoo can be removed more thoroughly and leave less of a mark than ever before with laser tattoo removal. 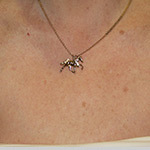 Results are permanent and the skin surrounding the tattoo is usually not damaged. Other methods of tattoo removal (excision or dermabrasion) are more invasive and can result in scarring. 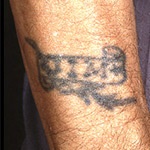 Laser tattoo removal is safe, non-invasive and targets the ink used in the tattoo process – not the surrounding skin. 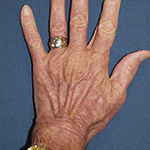 Occasionally, a patient may experience a slight lightening of the skin after the tattoo is removed. Scarring can occur, but is rare. Emitted as a pulse of light, the laser is directed at the colored areas of a tattoo. When the colored ink particles in the tattoo absorb the laser light, they are broken into tiny fragments. These fragments are then absorbed through the body’s natural cleansing process; this usually takes a few weeks. Several treatments may be required; the number of treatments will be determined by the depth of the pigment granules and the color of the tattoo. Laser treatments should be performed 2 to 3 months apart to allow your body time to remove the maximum amount of tattoo pigment. While treatments do not require anesthesia, some patients are more comfortable with local numbing provided by an anesthetic cream. Normally, this is applied at least 30 minutes before the treatment. Treatment sessions usually last 10 to 30 minutes. 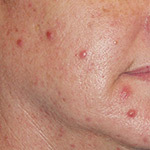 Acne can be a difficult condition to improve. Sometimes topical medications, Accutane, or long term oral antibiotics will help. While these medications are useful, there are those patients who would prefer to have a simple series of laser treatments to clear up their acne. Now they have that option. The Smoothbeam laser will be used to clear up your acne by shrinking overactive oil glands. For most patients, a series of treatments will provide long-term improvement. Treatments are fast and require no injections, although they will leave your skin looking slightly red for a short time, typically less than an hour. A topical anesthetic applied about 30 minutes before the procedure is recommended. Small dilated veins on the face or body can usually be safely and painlessly removed with a single variable pulsed dye laser treatment, although more than one treatment may be necessary for some patients. The treatments can result in a slight bruise that may take about a week to clear. No injections are necessary. Patients interested in this procedure should not be tan when they come in for treatment and should wear sunscreen after their treatment. 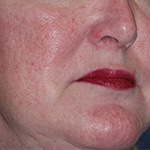 Rosacea patients and patients with venular malformations (port wine stains) can also be helped with the pulsed dye laser. Click here to see more photos of Laser Aesthetic Procedures. Click here to see CO2 Laser Resurfacing. Click here to see ND: Yag Laser. Click here to see V-Beam Laser.